Homewood’s defense had a tough night trying to stop defending 6A state champion Pinson Valley last week at Waldrop Stadium in Homewood. Journal photo by Lee Walls Jr.
Homewood defensive lineman Antoine McGhee, above, gets by a Pinson Valley blocker. 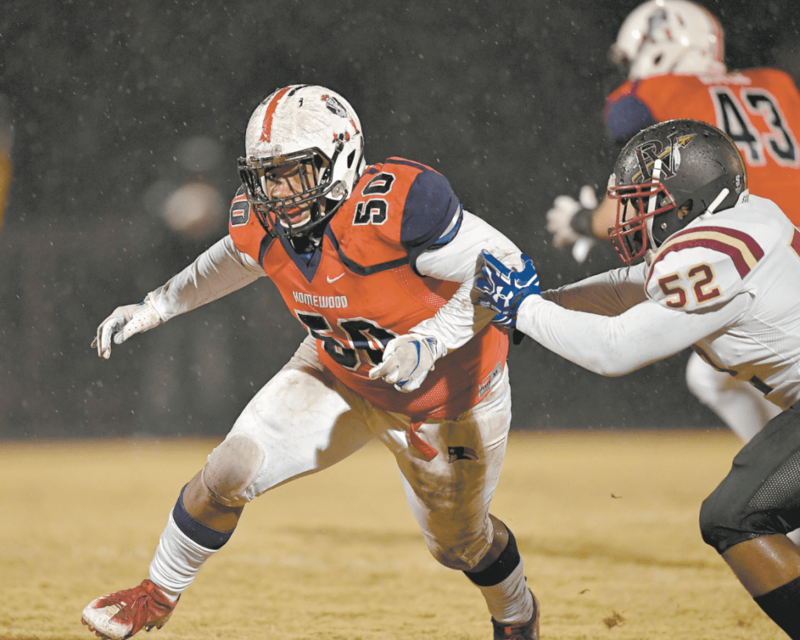 Journal photo by Lee Walls Jr.
Homewood reached the quarterfinals of the state playoffs for the first time since 2006, but defending Class 6A champion Pinson Valley made sure the Patriots would advance no further. Pinson senior quarterback Bo Nix showed Homewood just what kind of quarterback Auburn would be getting, since he is an Auburn commit. Nix completed 22 of 33 passes for 298 yards and four touchdowns, leading the Indians to a 48-7 victory against the Patriots last week at Waldrop Stadium. 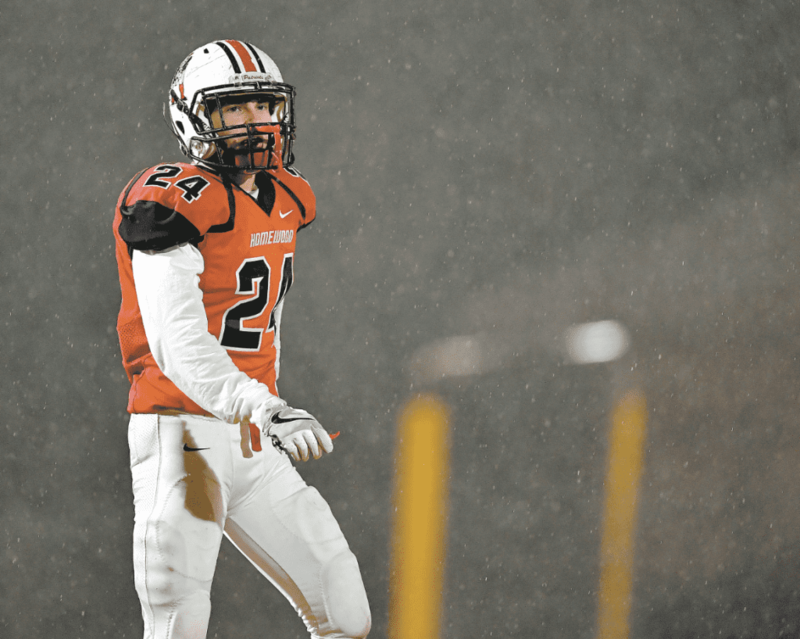 Nix also scored on a 47-yard run in the second quarter that gave the Indians a 28-0 lead. Marcus McGhee scores a touchdown on an 8-yard pass in the second quarter. McGhee finished with nine catches for 63 yards. Journal photo by Lee Walls Jr.
Nix threw two touchdown passes each to Demarion Holloman and Tye Pouncey. 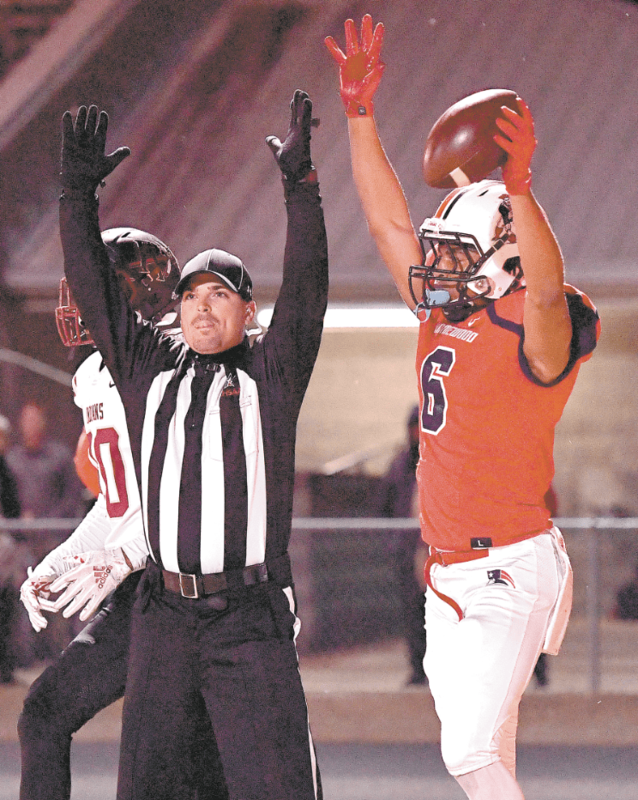 “We just ran into a team that had more horses than us,” Homewood coach Ben Berguson said as the Patriots finished their season with a 10-3 record. Pinson (12-1) will host Clay-Chalkville in the Class 6A semifinals Friday. The Indians’ only loss came to Hoover in the first game of the season. Homewood quarterback Larkin Williams completed 23 of 39 passes for 181 yards and a touchdown, on an 8-yarder to Marcus McGhee in the second quarter. McGhee finished with nine catches for 63 yards. The Patriots were hurt by two turnovers in the first quarter that enabled the Indians to take control early. Hoover running back Larry McCammon. Journal photo by Marvin Gentry. 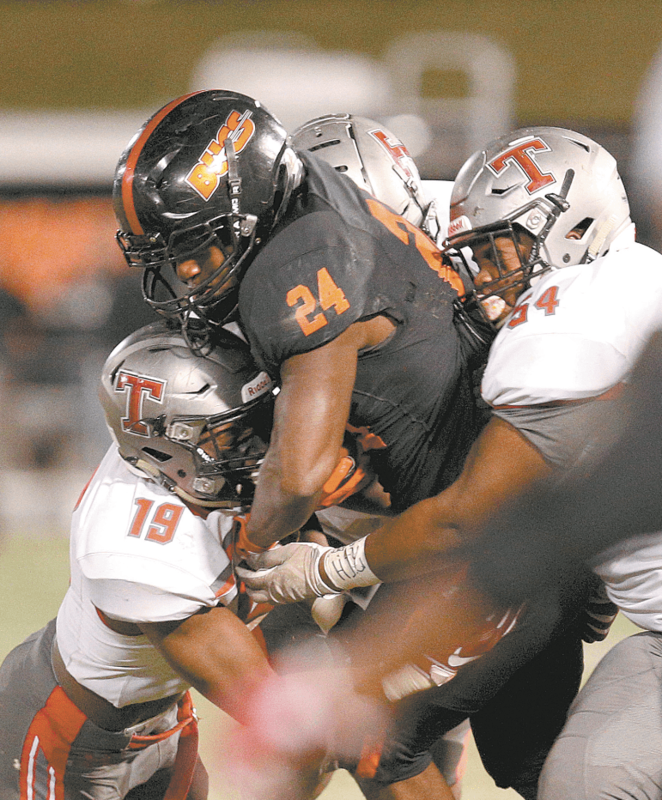 In the aftermath of Hoover’s disheartening 31-28 loss to Thompson in the Class 7A semifinals last week at the Hoover Met, Bucs head football coach Josh Niblett praised his seniors for their career accomplishments. Hoover Sophomore running back Dylan Pauly is brought down by several Thompson defenders in the Bucs loss last Friday at the Hoover Met. Journal photo by Marvin Gentry. Three of the Bucs’ seniors — receiver George Pickens, running back Larry McCammon and kicker Will Reichard — have been selected to play for the 2018 Alabama All-Star football team, which will meet Mississippi in the 32nd Alabama-Mississippi Classic on Dec. 17, 6:30 p.m., at Cramton Bowl in Montgomery. Niblett will serve as the Alabama head coach. More Hoover seniors could join Pickens, who has committed to Auburn; and McCammon and Reichard, who have committed to Alabama. The Alabama defensive All-Stars were scheduled to be announced this week. The Bucs’ seniors were part of back-to-back Class 7A championship teams in 2016 and 2017. It appeared they were headed back to the Super 7 Championships to go for a three-peat. Hoover clawed back from an early 14-0 hole and a 17-14 halftime deficit against Thompson to take a 28-17 lead with two third-quarter touchdowns. McCammon scored on an 18-yard screen pass from junior quarterback Robby Ashford, and Jaeden Sankey fell on a blocked punt in the end zone for the other score to put the Bucs ahead. 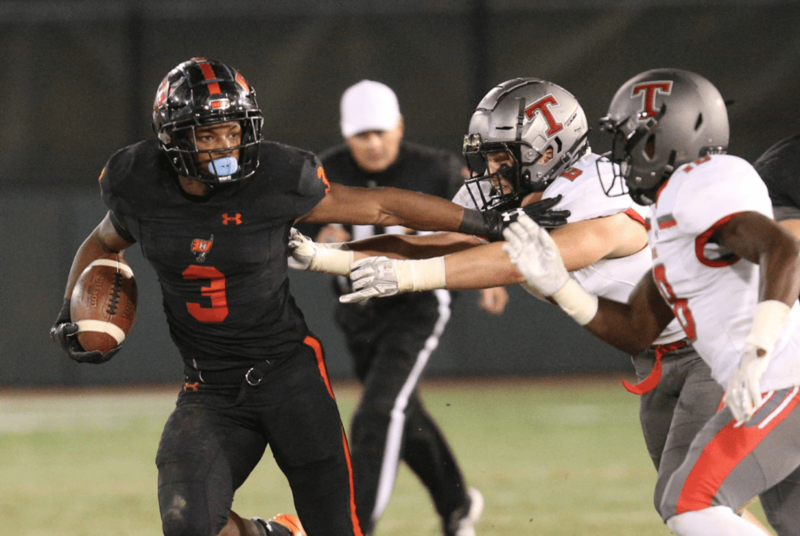 But Thompson’s stellar senior quarterback, Taulia Tagovailoa, an Alabama commit, brought the Warriors back in the fourth quarter. After Reichard missed a 45-yard field goal, Tagovailoa threw a 56-yard touchdown pass to A.J. Bonham to cut the Bucs’ lead to 28-23. 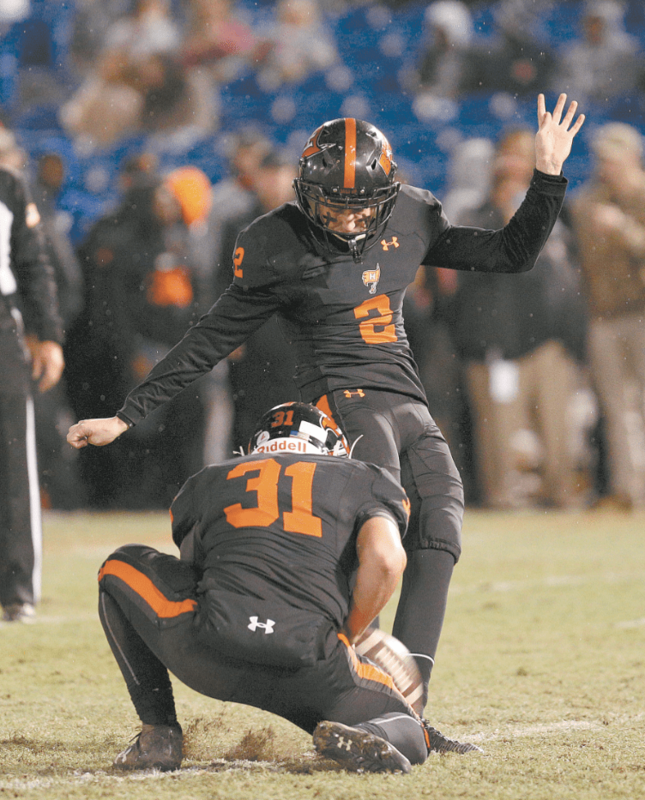 Hoover kicker Will Reichard. Journal photo by Marvin Gentry. Then, late in the fourth quarter, Tagovailoa engineered an 85-yard game-winning drive, capped by Shadrick Byrd’s 3-yard scoring run and a 2-point conversion with 21 seconds remaining. After the kickoff, Thompson’s Jalen Bustamante intercepted an Ashford pass to seal the Bucs’ fate. Bustamante had two interceptions in the game. Tagovailoa completed 12 of 28 passes for 228 yards and a touchdown. Byrd scored the game’s first two touchdowns and finished with 125 yards rushing on 23 carries as the Warriors avenged a 45-26 loss to the Bucs on Sept. 7. Ashford completed eight of 15 passes for 137 yards and a touchdown, and he rushed 12 times for 63 yards and two scores. McCammon ran for 98 yards on 23 carries and caught three passes for 88 yards. Thompson (12-1) will play Central-Phenix City (13-0) for the Class 7A championship on Dec. 5 at 7 p.m. at Auburn’s Jordan-Hare Stadium. Hoover finished 9-4, the first time since 1999 that the Bucs did not win at least 10 games on the field. The Bucs had appeared in a state championship game every year from 2000 to 2017, except for 2007 and 2015, when Spain Park represented the North bracket.